Bishop Raymond Pranoto is married to Juliet and they have been blessed with a lovely daughter Michelle. 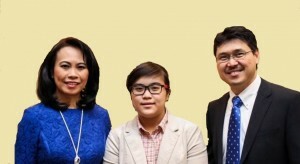 Bishop Raymond and Juliet Pranoto are the senior pastors of International Bethany Community Church located in Washington DC, as well as in other cities in America and also in Mozambique, Africa. Bishop Raymond started his ministry as a music leader. Pastor Juliet started her ministry as a worship leader and youth leader. They were then sent as the first missionaries in America in 1996 by Dr. Niko Njotorahardjo, who was the senior pastor of Bethel Indonesian Church, Gatot Subroto. Besides being the senior pastors of IBC Church, they have established DC Prayer Tower in 2000 located in the business district of downtown Washington DC. Up to now, DC Prayer Tower has networked with various prayer organizations in the Washington DC area and in nations. Since 2012 they have done prayer tower trainings in America as well as in other countries such as Japan, Sri Lanka, India and also in the Philippines and Hispanic community. They have also established prayer towers in Los Angeles, Las Vegas, Sri Lanka, India, Australia, and Japan.